AMMAN, Jordan (CNS) — Church bells are ringing once again in the Assyrian Christian villages dotting the Khabur River in northeastern Syria after Islamic State militants were routed by a combination of forces. It’s a stark contrast to the mounting concerns for one of the most renowned archaeological sites in the Middle East following the Islamic State militant sweep into the ancient Syrian city Palmyra, a UNESCO world heritage site. Some feared the extremists would hammer and bulldoze the revered antiquities site as they have done to archaeological areas in Iraq. Palmyra’s capture marked the second military blow by the extremists in mid-May, following the fall of Ramadi, Iraqi. Some feared Islamic State militants might now possibly control half of Syria. Despite the Islamic State militant victories in Iraq and Palmyra, the extremists have suffered a setback in Syria’s northeastern province of Hassakeh. There, Kurdish and Assyrian Christian fighters have again wrested control over the Abdul-Aziz Mountain near the village of Tal Tamar, according to activists and Christian officials in Hassakeh. The Kurdish (People’s Protection Unit) and Christian (Syriac Military Council) commanders reported that the victory would not have been possible without the support of the U.S.-led coalition airstrikes. The bombing raids, they reported, enabled these units to regain control over several villages and seize large caches of arms and ammunition from the extremists. “This is very happy news,” Father Emanuel Youkhana, who heads the Christian Aid Program Northern Iraq, CAPNI, told Catholic News Service. His group provides practical aid to Syrian Christians who have been displaced by Islamic State. Other priests have returned to their villages and followed suit, he added. However, he cautioned Christian villagers from returning home too quickly because the militants left behind mines. “Three Kurdish fighters were killed by (Islamic State) landmines, and a cleanup operation is underway,” Father Youkhana said. Mount Abdul Aziz overlooks the area of ongoing conflict in the Hassakeh area, which borders Turkey and Iraq. It was from the vantage point of the mountain that Islamic State militants stormed down Feb. 23, seizing Assyrian Christian villages along the Khabur River, capturing more than 220 Assyrian Christian residents and killing many villagers. Father Youkhana said that the Christians are still being held by Islamic State militants but are believed to be treated well. Another Catholic priest based in Jordan, Father Rifat Bader, who cares for Iraqi Christians who were forced out of their ancestral lands, expressed concern for the fate of the Christians still in the militants’ hands. Meanwhile, the Islamic State capture of Palmyra is the first time Islamic State has wrested control of a city directly from the Syrian government military and its allied forces. Syria’s head of antiquities, Maamoun Abdulkarim, urged the world to save Palmyra’s 2,000-year-old colonnaded streets, theater and temples from destruction by Islamic State extremists, who consider such antiquities as pagan. 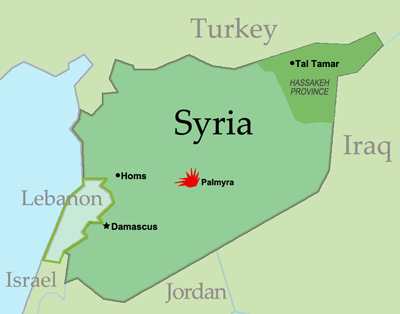 Palmyra also represents a strategic military gain. It houses Syrian government army installations and is located on a highway linking the capital, Damascus, with Syria’s eastern provinces, mostly under insurgent control.